My fave product of the day was imPRESSive. (Sorry, I'm a little slap happy from not sleeping for more than 6 hours total since I've been in Florida!) Yes, QuicKutz has come up with the new amazing product that will do letterpress (printing & debossing), called... wait for it... Letterpress! It's an amazing product that runs through the Epic die cut machine. With beautiful inks & letterpress designs. You can now make everything from greeting cards to business cards, to wedding invitations to birthday invites, to scrapbook embellishments and beyond! 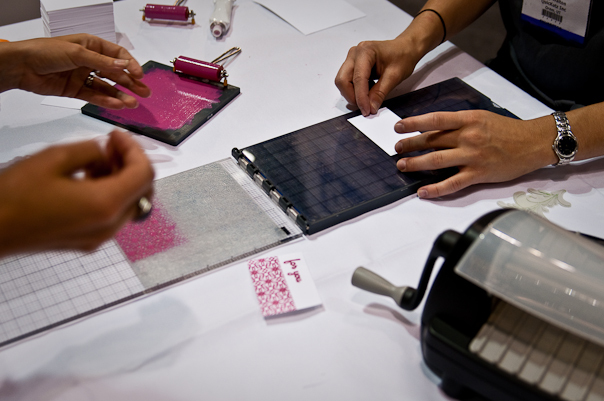 Letterpress is a technique that debosses an inked image onto a fibrous cotton type paper. 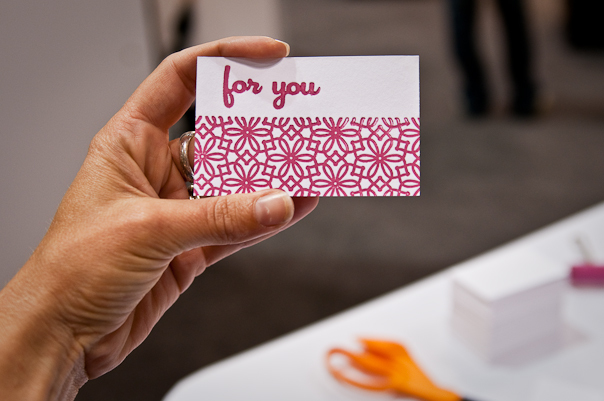 (Think custom business cards or wedding invites). To top it all off... it's SUPER easy! You can impress your image with or without the amazing ink colors. 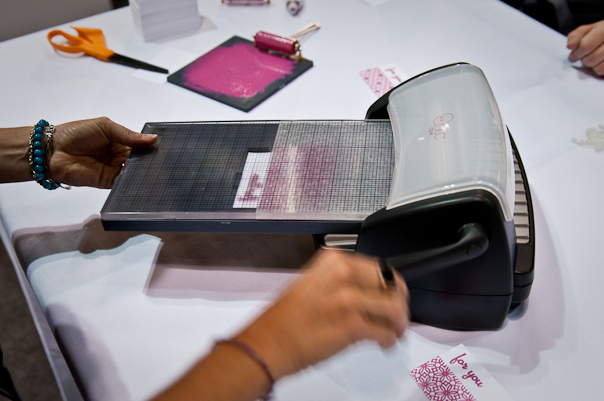 Does it work with any of the other die cut machines like the Sizzix Big Shot? I soooooo want to buy this and look forward to learning more about it!!! I was going to asks the same question as Cassie...I am not about to buy another manual die machine since I like my Big Shot. I would buy the Letterpress if it works with my machine. I so love that letterpress! Looks so cool. Do I need to add this to my must haves? LOL!! Nifty! Looks like a pretty cool tool. I'm sure if this is a must have for me yet - can't wait to see more about it though. this is the big winner for this year's show, imho. I can't wait to get this one! I bet it would this would really jazz up plain old mats for 4 x 6 photos or card backgrounds to look very pretty and you could make as few or as many as you needed. I'd love to see how the printing would look done in one color way, like dark blue in on a lighter blue paper. I saw this demo'd at the CHA Craft show and it is amazing. So easy to use and the results are perfect. The paper you use is really, really nice and love that you can feel the images. IF I was a cardmaker, I would buy this in a heartbeat. Maybe someone will show great ways to use it in scrapbooking and then I'll have to have it too but all I have seen is cards demo'd so far. But let me tell you, it's awesome. According to the QuicKutz team, the results are guaranteed on the Epic, but it will work on other machines. It may need to be shimmed a bit, but there's a place in the system to do that. 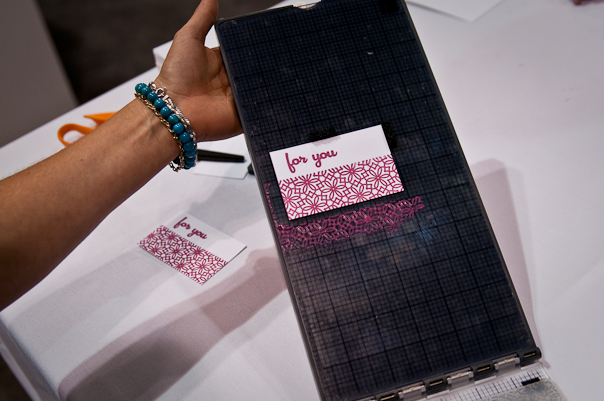 I stumbled on your blog while looking into diy letterpress. 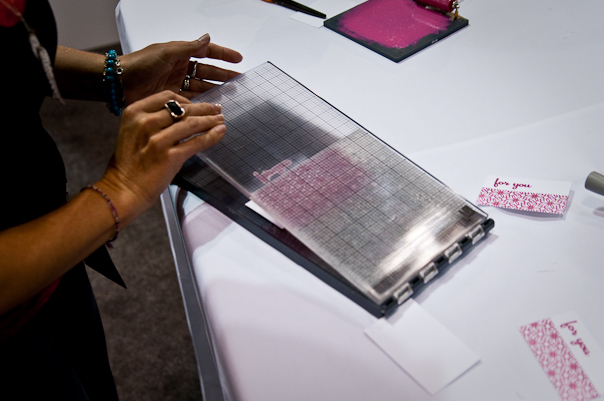 Have you used the Letterpress L since this post? I'm curious if the Letterpress holds up after time, esp. reading about other users' experiences with Quickutz's plates. Thanks!